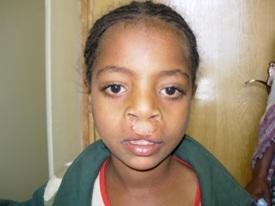 Meseret Asefa is a 9 year old girl who was born with a bilateral cleft lip and palate. She is from Bonga, 460 Km southwest of Addis Ababa, Ethiopia. She is lives with her mother and has 4 sisters and 1 brother. Her mother says she was shocked when she saw Meseret for the first time. In Ethiopian culture, sometimes babies born with cleft are looked upon as a curse. Her family encouraged Meseret’s mother to starve the baby, but Meseret’s mother did not follow their advice. Her father’s family accused her mother of causing her cleft lip and palate. Despite extensive research about cleft lip and palate, its’ causes are still unknown. It is thought to be caused by a combination of factors. Meseret’s father subsequently deserted the family. Her mother has since remarried. Meseret had her lip repaired at Atat hospital, Woliqite at the age of 8 and then they referred her to Yektit 12 hospital for palatal surgery. In 2011, her palate was repaired when she was eight and a half. She also received speech therapy and bone graft surgery. Since Meseret was not treated until she was 8 years old, she stayed at home while others her age went to school. Some cleft lip and palate patients often find it difficult to attend school, communicate easily, find jobs or get married. Following the surgery and speech therapy, she was sent to her hometown with a letter which explained her condition, the treatment she received and how her classmates can support her. She is now in grade 2. Meseret and her mother are both very proud of how far they have come and the treatment they received. See how you can help close the gap in cleft care.